“Less than one week after iOS 8 was made available for download, Apple on Tuesday announced the next-generation mobile operating system is now on 46 percent of devices linked to the iOS App Store,” AppleInsider reports. MacDailyNews Take: The differences between Apple’s iOS and the iOS wannabes are stark. Bloody Hell, that was quick. Did my iPad over the weekend. Seems fine. Holding back on the phone though. Getting reports that 4S sloooooowwwwssss down quite a bit more than you would expect. Expecting Apple to find and correct at some point, so I can hold off there. i am holding off on our 4s phones for the same reason, but i updated our ipads with no problems except that the icon for mdn in the safari recently visited list also shows up for espn. and i really dislike the expanding and contracting list of favorites in safari. I updated my 16GB 4S on release day. Other than it taking forever, I don’t notice any real slow downs. I did back it up and deleted crap I wasn’t using. Can’t wait to upgrade and see iOS8 on the bigger screen. While not a large enough sampling really, I know my experiences and those of my friends and family have been excellent for iOS 8. I personally have upgraded 2 iPhone 4s’s, 2 iPad 2’s, 1 iPad Mini, and 2 iPhone 5s’s along with getting a new iPhone 6. It has been utterly seamless with no issues. My friends and family (too numerous devices to mention) have had the same experiences with iOS 8. Did you know that if you do the update through iTunes you don’t have to clear off space on your device the same you do when updating from on the device? My kids had the same constraint and I had them do the update through iTunes so they didn’t have to go through all that rigamarole. If you update from the device, iOS needs enough space to download the OS, verify it, etc. When you update through iTunes, your computer stores the downloaded OS throughout the process instead. I’ve been running iOS 8 since the developer release, on an iPhone 4S that is no longer associated with any cellular carrier (so think “iPod touch” but with iPhone 4S specs 😉 ) There is some stutter when swiping between home screens and the like, but for the most part, it’s still as quick as I think it was under iOS 7. Android’s latest OS only took 7 DAYS to reach 46 users to adopt it! So there, Apple! I just read somewhere that KitKat, released last year, is only around 24% to 25% adoption rate. It was only 10% after 6 months. I guess when you are basing your Android version adoption shares on the Google Developer dashboard pie chart you’ll only see data that accounts for Google Play activity during the past 2 week period. May not be the best gauge now-a-days for actual OS share. 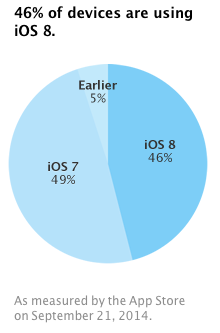 On the other hand that same pie chart may be better as an indicator for how long lived some devices are since OS ‘upgrade’ is rather slow. Colin is trying to install IOS8 on his Android Phone. Its the only way his take would be justified. Why would I want to put IOS 8 on my Note? I already have all the features of IOS 8 and they work. If I installed IOS 8, my apps would not fit the screen, one handed use would become difficult, I would be dealing with bugs for six months or more and my battery life would go down dramatically. I like something that “works right out of the box” thank you. Not until after the first couple of point releases thanks all the same.